LSU's Les Miles has his young team playing excellent football right now, but Nick Saban and Alabama come to Baton Rouge this week for what could be a College Football Playoff elimination game. Ed. Note- This week we are adding a "picks against the spread" feature to our college football preview. New correspondent Andy Dougherty will still handle the previews, but will now pick games against editor Joe Parello. We'll see how they do. The slate of games in Week 11 of the college football season offers a number of savory matchups. Six games contested between top-20 teams will carry significant playoff implications. But before previewing those matchups, here is a snapshot of last week’s most notable events. Week 10 of the college football season had no shortage of excitement. No. 11 Georgia, No. 12 Arizona, and No. 23 East Carolina all suffered upset losses. No. 20 West Virginia almost pulled off an upset over No. 7 TCU, but the Mountaineers fell by a point in the end. No. 25 Louisville had No. 2 Florida State on the ropes before the Seminoles stormed back from 21 points down to claim an 11-point victory. No. 17 Utah suffered a heartbreak overtime loss to No. 14 Arizona State. But the biggest story of the week unfolded in Oxford, Mississippi. Late in the fourth quarter, Ole Miss receiver Laquon Treadwell burst through a hole in the Auburn defense and appeared to score the go-ahead touchdown. Unfortunately, an awkward tackle at the goal line left Treadwell with a broken leg and dislocated ankle, ending his season. Adding insult to injury, officials determined upon review that Treadwell let go of the ball prior to crossing the plane, and Auburn recovered the ball in the end zone for a touchback. Auburn held on to win, validating its place as the No. 3 team in the country. Ole Miss fell from 4th to 11th in the standings, leaving its playoff chances in serious doubt. Auburn deserves plenty of credit for its stellar season and hard-fought win, but what a shame for a play like that to play such a prominent role in derailing what had been a promising season for the Rebels. At least they have a laughable matchup at home against Presbyterian to look forward to next. This week features two matchups between top-10 teams, which have plenty of postseason implications, but No. 5 Alabama at No. 16 LSU is the game of the week. Alabama coach Nick Saban travels to Baton Rouge, where he coached the LSU Tigers during their 2003 BCS National Championship run. Saban has added three more National Championships to his résumé at Alabama, including a victory over LSU in the 2011 BCS National Championship Game. With LSU’s only losses coming to current No. 1 Mississippi State and No. 3 Auburn, how are the Tigers 16th? The whole country will be asking that question if LSU comes up with the win on Saturday. But Alabama has been the team to beat in college football for the last five years and will once again be favored. 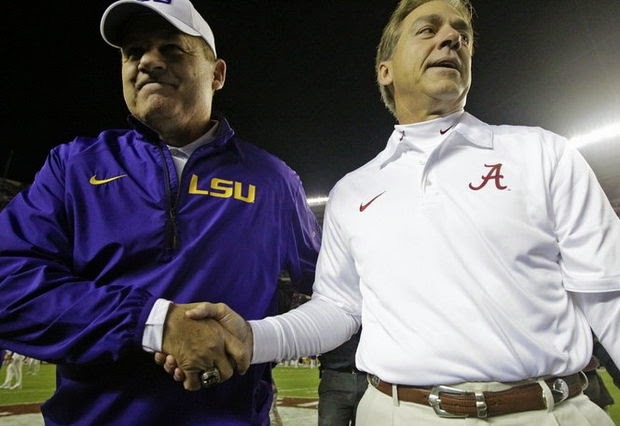 The outcome of this SEC West battle will depend on which LSU team shows up. Will it be the team that beat Ole Miss and gave Mississippi State its toughest game of the year, or the team that lost to Auburn by 34? After a big win and a bye week, LSU will likely come ready to play on Saturday. AD: LSU plays at home under the lights. A win would put the Tigers back in the playoff discussion, and they have all the motivation they need going against the Crimson Tide. They might not pull it off, but this should be a battle. JP: Never bet against the Tigers at home, especially in night games. Death Valley is going to be crazy, and Les Miles has been pushing all the right buttons with his young team the last few weeks. The Bayou Bengals believe in themselves, and the emotion of the night should keep this thing within a single score, if they can't pull off the upset outright. AD: Kansas State travels to TCU in a battle for Big 12 supremacy. The two teams have identical 7-1 records, but Kansas State is undefeated in Big 12 conference play. Defense was optional for TCU’s lone conference loss, which came 61-58 at the hands of Baylor. The 61 points TCU allowed in that game were more than twice as many as they allowed in any other game this year. Kansas State will provide another stern test for the Horned Frogs’ defense. TCU has a top-flight offense led by quarterback Trevone Boykin’s 26 total touchdowns, but this game will be a chance for the Horned Frogs to prove they can play championship caliber defense as well. More likely than not, Jake Waters and the Wildcats will expose the TCU defense. The Wildcats are 15th in the FBS with 38.3 points per game, while the Horned Frogs are 2nd, scoring an incredible 48 points per game. Get ready for a shootout. Kansas State is undefeated on the road with a win at Oklahoma, so the Wildcats shouldn’t be fazed traveling to TCU. The two teams’ results have been extremely similar this year, so this game should be another tossup. It will be difficult for TCU to win big. JP: Dang it, why am I still taking road underdogs? I just can't help myself, especially here, where I love K-State coach Bill Snyder. The Wildcats are a flukey loss to Auburn away from being a Top-2 team right now, and this game should serve as a College Football Playoff elimination game (admittedly, TCU is a flukey loss to Baylor away from being in the same spot). The Horned Frogs come in with the better offense, but so much of it is based off swings and quick screens, that I think KSU can find a way to contain TCU's passing game. TCU will still score points, but the Wildcats are no slouches on offense themselves, averaging over 38 points per game behind the dual-threat play of quarterback Jake Waters. I like KSU's coach, quarterback and defense better, plus I'm getting the points. I guess that's enough for me to take the Wildcats over TCU in Fort Worth. AD: Both teams absolutely need this win to be considered for the College Football Playoff. At least Arizona State will have another big matchup to end the regular season against the Arizona team that handed Oregon its only loss. But Arizona State is easily the highest caliber team left on Notre Dame’s schedule. The Irish need to deliver an impressive performance on Saturday or they will have no chance to put themselves back in the playoff discussion. After a dominant start against Navy last week, Notre Dame’s leading tackler Joe Schmidt suffered a season ending injury. The Irish then showed some gaping holes on defense and let the Midshipmen back into the game. Despite an incredible six-touchdown performance from Everett Golson, Notre Dame’s shaky defense likely drove the CFP selection committee’s decision to move Arizona State ahead of them in the standings. The Irish will have to adapt quickly and fill the void at middle linebacker to pull off the upset on the road. Arizona State has shown vulnerability at home, getting crushed by UCLA and requiring overtime to beat Utah. Notre Dame has a golden opportunity to notch its only top-10 win of the year over a team that probably doesn’t deserve to be there. JP: As well as Arizona State has played lately, they still needed overtime to beat a plucky, but not dominant Utah squad, and their two impressive wins (USC and Stanford) came against teams that I'm not totally sure are actually any good. Meanwhile, they have a 35-point home loss to UCLA to their name. Look, Notre Dame isn't perfect either, but I like Irish quarterback Everett Golson slightly better than Sun Devils starter Taylor Kelly, who is still shaking off the rust from a foot injury. That, and I think the Notre Dame defense is due for a bounce back after a few rough showings in a row. AD: Another battle for supremacy in a Power 5 conference pits Ohio State against Michigan State in a Big 10 showdown. In Michigan State’s last game, the Spartans dominated the hapless Michigan Wolverines 35-11. The win further affirmed that Michigan State has supplanted Michigan as Ohio State’s main rival, and this week’s game is now the premiere Big 10 matchup. Like many games this week, the winner will be firmly in the playoff discussion while the loser will be all but eliminated. Both teams have been extremely efficient this year. Michigan State ranks 5th in the FBS in both scoring offense and total defense. Ohio State ranks 4th in scoring offense and 8th in total defense. Something has to give. Ohio State will need to keep a close eye, and probably two or three defenders, on Tony Lippett. Of the 21 FBS players averaging at least 20 yards per reception, Lippett ranks first in receptions, yards and touchdowns. He is arguably the best big play threat in the country, and he has made a serious impact in every game this year. Michigan State has only lost to Oregon, and there’s no shame in that. There is a little shame in losing to Virginia Tech by 14 at home, like Ohio State did in week two. The Buckeyes have rebounded admirably, but Michigan State is playing at home and appears to have the more dangerous team. JP: If "good" Connor Cook shows up, the Spartans can play with anybody in the country, and their defense is finally starting to show coach Mark Dantonio's signature bite. Ohio State is far better than the national media would have you believe (since freshman QB J.T. Barrett got his feet under him, the Buckeyes have scored 50+ in four of their last five games), but I still think Michigan State is more experienced and battle tested. Plus, the Spartans are coming off a bye and playing at home and, as Andy said, Tony Lippett can catch anything within 30 feet of him. He may have the gravitational pull of a small moon. Scientists are looking into it. AD: The selection committee was more gracious to Utah this week than any other losing team. Members of the committee considered Utah’s overtime loss to Arizona State a quality effort, and they did not drop the Utes at all in the rankings. But Heisman frontrunner Marcus Mariota and the Oregon Ducks will provide the biggest challenge Utah has faced this year. The Utes have not allowed 30 points in a game this year, but Oregon has averaged over 45. Utah’s top-20 run has been fun, but it will probably end on Saturday. Oregon simply has more talent on its roster than Utah. Marcus Mariota will be the best player on the field, and he should lead the Ducks to a comfortable win. JP: Utah is a deceptively tough place to play and the Utes have been a deceptively good team this year, but let's be honest, Oregon is a Top-5 team with a Top-2 quarterback in Marcus Mariota. If the Ducks can't pull this one off with a trip to the College Football Playoff on the line, coach Mark Helfrich may want to start packing up his office. Bryce Petty and the Baylor Bears have showcased the most productive offense in the country this season. Oklahoma quarterback Trevor Knight has not been nearly as impressive as Petty, though he was impressive enough to catch Katy Perry’s attention last month. Baylor leads the nation with 50.4 points per game while Oklahoma ranks 8th with 41.5, so expect another shootout in this Big 12 contest. Baylor is the higher ranked team in the CFP and AP rankings, yet the Bears still find themselves as 5.5-point underdogs. Baylor has been relatively unimpressive on the road, most recently losing 41-27 to West Virginia. Both of Oklahoma’s losses came by less than five points against teams currently in the top 7. Oklahoma was considered the far better team going into the season, and the Sooners are really only ranked behind Baylor now because Baylor hasn’t played Kansas State yet. The Bears lead the nation in scoring at over 50 points per game, and Oklahoma has given up over 26 points in half of their eight games this year. While the Sooners have the talent to contain Bryce Petty and the Baylor passing attack, it's hard to see them totally stopping it for an entire day, and the Sooner offense has stalled at times this season, most notably in a win against Texas where the Longhorns thoroughly outplayed Oklahoma but gave the game away because of turnovers. I know the game is in Norman, but I would pick Baylor on a neutral field, so if you're gonna give me 5.5 points, I'll take it.